WILLEMSTAD - The Isla refinery modernization will be faster than anticipated. 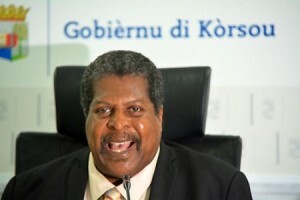 This is according to Prime Minister Dr. Ben Whiteman during the weekly press conference of the Council of Ministers. In the modernization process the refinery will switch to gas. In late March, the tender will be issued for the construction of the gas terminal. The Prime Minister also said he regrets the motion that was passed in the Dutch House of Representatives this week to get the refinery cleaner within three months. He calls the motion undue pressure from the Netherlands. Nevertheless, he says that every motion that is in favor of the health of the Curaçao population is welcome.